Varanasi, Jan 22 (IANS) Prime Minister Narendra Modi on Tuesday told overseas Indians that his government is making efforts to ease the processes concerning their social security, passport, visa and PIO and OCI cards and that work is on to issue chip-based e-passports. Inaugurating this year’s Pravasi Bharatiya Divas (PBD), the Indian diaspora conclave, he said that the government’s endeavour was that overseas Indians should stay “happy and safe wherever they are”. “The government is trying to ease the entire processes concerning your social security, passport, visa, Persons of Indian Origin (PIO) and Overseas Citizen of India (OCI) Cards. We have taken a new step a few months back concerning overseas Indians. Our embassies and consulates are being connected to the Passport Seva Project worldwide,” he said. The Prime Minister said that along with passport, the rules related to visa were being simplified. “With the convenience of e-visa, you are also saving time and problems are also getting reduced. Modi also urged Indians or people of Indian living abroad to contribute to the building of a new India and said that the changes that were coming in India were becoming new opportunities. “In this changing India, you can play a big role in research and development and innovation. He said that in the last four years, India had taken a major step towards achieving its natural position in the world. Stating that today India led the world in many fields, he said the International Solar Alliance was one such example. Ahead of this year’s general elections, Modi also launched an attack on the Congress over the issue of corruption citing a quote by former Prime Minister Rajiv Gandhi. But his government was using technology to eliminate this loot. Modi’s Mauritius counterpart Pravind Jugnauth, the chief guest at the event, commended India’s efforts in reaching out to the diaspora. Earlier, External Affairs Minister Sushma Swaraj welcomed the gathering. Organised by the External Affairs Ministry and the Uttar Pradesh government, the Indian diaspora conclave this year has over 5,000 delegates registered. This year’s theme of the convention is “Role of Indian diaspora in building a new India”. 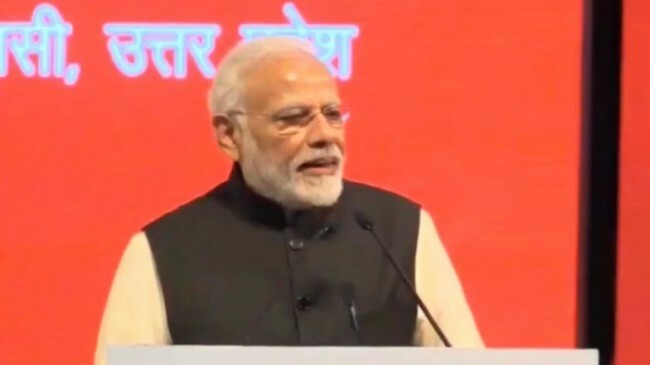 Modi called this year’s PBD the “most successful” event saying the people of Varanasi, his Lok Sabha constituency, have taken ownership of the three-day jamboree.